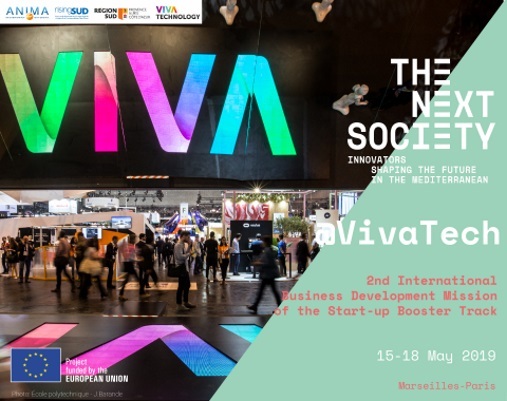 THE NEXT SOCIETY’s 2nd International Market Mission will be organised in the framework of Viva Technology 2019 after the first the mission at the Web Summit in Lisbon organised by Berytech last November.THE NEXT SOCIETY will gather a delegation of entrepreneurs in Marseille and Paris, France during this event- the world rendez vous for startups and leaders - from 16 to 18 May 2019 to join the 2nd International Market Mission of the Start-up Booster Track. It is for them a unique opportunity to get exposure on the latest tech and digital trends, gain international visibility and have access to a valuable network of leading business experts and catch B2B opportunities. This mission is organised by Rising Sud, the economic development agency for the Sud region in the South of France. More information on the programme soon. The 2nd International Business Development Mission will be organised in the framework of the Regional Tech Tour & VivaTech trade show to promote companies from the Mediterranean region. What is offered is a full business trip of one day in Marseille and its area and two days at VivaTech, where the South Region has chosen to go with an innovative “LAB“ space of 400 m² located just in front of Afric@tech.